Steven Butala: Welcome to the Land Investors Show, entertaining land investment talk. I’m Steven Jack Butala. Jill DeWitt: And I’m Jill DeWitt, broadcasting from sunny southern California. 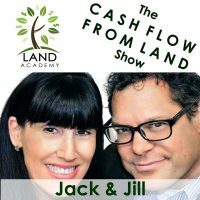 Steven Butala: Today Jill and I talk about the real cost of using data to purchase undervalued property. The actual cost, the price per unit I should say, or included in that is the actual cost of not using it. Trying other ways and methodologies. Steven Butala: And the real cost of actually not using our experience, which is free. Steven Butala: But before we get into that, let’s take a question posted by one of our members on the LandInvestors.com online community. It’s free. Steven Butala: Great questions, Matt. We buy commercial property probably once a month here, and the first thing I do is go onto the EPA’s website, the Environmental Protection Agency, and make sure that the property is not logged in there, it’s not part of super [inaudible 00:01:28] site, and more importantly, and I think this gets overlooked about commercial property all the time, is what’s going on in the immediate area of the property. I’ll give you a very, very quick story. I did a commercial real estate deal a lot of years ago that it got terminated and didn’t close. Broke my heart actually. I was really young, I needed the money. Didn’t close because there was a former gas station three blocks away, and it had a tank that was still in the ground and the lender said they wouldn’t lend on it based on that. Jill DeWitt: Because it was too close. Jill DeWitt: Well, it could happen. Steven Butala: Yeah, which is really silly. There’s a lot of people get real heated in real estate about the EPA and how they’re vigilante about it. But that’s a time for a different debate. So, that’s the real difference. And then LoopNet is if it’s a real piece of commercial property, and LoopNet is the single place to buy and sell commercial land. Jill DeWitt: Aren’t mobile lots considered commercial? Steven Butala: Well, that’s another thing. Yeah, sometimes. No, mobile are considered mobile. But the thing with commercial property is that you can zone down. Jill DeWitt: I love it. Steven Butala: So, go ahead, Jill. Steven Butala: Some of it’s like a park or agriculture land. Jill DeWitt: Exactly. So, there’s different things like that. So, then it gets real specified, and that’s what I mean by … You’re down at that. I say down, but it could be up for somebody else. If somebody loves it, they see it as a positive. But for us, I want land that I can do more with because then it’s even more of value to me, and I reach more people, and there’s more options. So, when I get in the commercial way out there, I’m pretty darn excited because I’m like wow. The first thing I do is I look to see, like what Jack said, what’s around there. Okay, great. It really is out there. It’s nothing. Can they put an RV on it? Can they put a mobile on it? Awesome, because that’s how I’m going to market it. Because you could do … Not only is it commercial. You could put a store on it. You could put an RV on it. Steven Butala: Well, you can’t walk in and do it. You need to apply for a zoning variance. But the deal is that a zoning variance has a much, much better change of happening if you’re going to zone down, not up. Jill DeWitt: Exactly. That you have all these options to do pretty easily. Steven Butala: You know, I always say … People ask me what’s the difference between investing in land and investing in houses. And I say investing in houses you almost to the dollar know what’s going to happen, but in land there’s always that pie in the sky, home run, knock it out of the park home run. Steven Butala: And the ones that Jill and I have had involve buying commercial property. Steven Butala: But you can buy commercial property for $5,000 or $10,000 and sell it for $300,000 or $400,000. Steven Butala: Don’t expect that on your first deal, or even your first year, but every year Jill and I do a deal like that. Jill DeWitt: Sometimes things come along. You never know. Steven Butala: Where the deal comes in, the offer comes in signed, and that’s when … Jill and I don’t work in the same office. In fact, we work in different zip codes to keep our relationship together. Steven Butala: We run to the bank. Jill DeWitt: Yeah. So, as far as posting it and everything, I still roll it into the system. Use all your normal channels for posting property. Clearly state why it’s different, because that’s a big deal. You don’t want someone to have to kind of dig to find. There’s somebody out there that’s looking for this kind of property traditionally, and by saying zone commercial, I would put that right in the title, by the way, and make it jump out. Because that’s awesome. And then LoopNet is awesome. What else were you going to say about that, Jack? Steven Butala: LoopNet is the end. It’s the best. Steven Butala: It’s going to reach … It’s expensive, but it will reach the right people. Jill DeWitt: And how do you suggest map for comps? You want him to use LoopNet comps or every comp or how do you want to do it? Steven Butala: Every way that you can use comps. Jill DeWitt: Just roll that in. Steven Butala: Comparison values for land, they do not take zoning into consideration. So, you’re going to see a piece of property that will hit the system, especially if you use assessor comps like we do, the data type comps. You’ll see what’s on there. Jill DeWitt: I hope he bought this. Steven Butala: I do too. Jill DeWitt: I hope by now he bought it. Steven Butala: Me too. I think I know which Matt it is. Jill DeWitt: I do too. Steven Butala: Today’s topic: The real cost of using data to purchase undervalued property. This is the meat of the show. So, one of the things that stops a lot of people from digesting this way of purchasing real estate is the actual dollar cost. Let me give an example. If you’re getting into this, or if you’re already in it and you’re trying to change the way that you’re buying real estate, get a better yield, and just generally improve on what you’re doing, you have a few choices, and some of them cost money and some of them don’t. Like driving for dollars, the dollar cost of it is free, or it’s the cost of gas. We don’t exactly know what the yield is going to be, and it’s a little bit more like fishing. But the actual dollar cost is close to zero. Knocking on doors, close to zero. Bandit signs, very, very small amount of cost. $100, $200. All those different ways attract people because of the cost. It’s close to zero. Data, when you actually download it and get it into the mail, costs about 0.10 a line item, and then the mail itself costs, I don’t know, what, Jill? 0.50, right? Jill DeWitt: Mm-hmm (affirmative) 58, 63. Somewhere in there. Steven Butala: So, let’s just use round numbers. To send out 3,000 letters to buy a house, which you’re going to make $25,000 on, it’s going to cost about $1,500. That’s the actual cost of using data and mail to purchase property. So, the question is are you willing to spend $1,500 to make $20,000? Jill DeWitt: I gotta think about that. Steven Butala: I mean, am I oversimplifying here? Steven Butala: I don’t think so either. Jill DeWitt: No. Because you know what, at the end of the day it is that simple. Why is it so hard to understand? Steven Butala: For land, here’s the numbers on land. Same thing. For every property that you purchase, you have to send out about 300 mailers. Rural vacant land now, and info lots. This actually includes that. So, you send out 300 letters, cost you about $150 to buy a property that you’re going to double your money on. In the info lot case, you’re going to make at least $10,000. Maybe $5,000 to $10,000. And the rural vacant property you’ll make same number. Probably $1,000 to $4,000 or $5,000 net. These are the numbers that we’ve been experiencing. So, yeah, am I oversimplifying this? Yeah, because you have to spend some money on education, or you really need to do a lot of research and time to figure out … Anybody can drop crap in the mail and nothing’s going to happen. Steven Butala: If I send an offer out in downtown Chicago for $500 an acre, I’m going to get laughed at and screamed at and waste a ton of money and upset a lot of people. That’s an extreme example, but to the same token you don’t want to send an offer out in a rural county in Arizona for $800 an acre at all. That’s high. So, $800 to $1,000 an acre in Arizona, everybody’s going to sign it and send it back, and you’re going to find out that you can’t sell it. Jill DeWitt: You wasted your time. Steven Butala: So, that’s the pendulum swung back there from the Chicago example in pricing. So you want to do it. You want to do it right. So, you’re going to spend some money on the education, and that’s my point. But my big picture point is what’s the cost of not doing it? This $1,500 marker, or spending this money on education, stops a tremendous amount of people. Jill DeWitt: Isn’t that funny? Steven Butala: From doing this. They just don’t have the money, and they’re concerned that they’re going to do it wrong. Steven Butala: So, you need that confidence, or you need to believe in … That’s why we set up LandInvestors.com to go get your confidence there for free. Steven Butala: The censure’s database is what you mean. Jill DeWitt: Maybe the whole thing was six weeks, but it took a couple more weeks after that point. Steven Butala: That’s how you grow old. Jill DeWitt: Right? Well, he’s like, and we were talking about, and I’m like, “How do you know they were doing it right with the data?” He goes, “I don’t.” And he was even nicely saying, “I’m still learning, Jill.” He’s like, “I’m not even sure what I’m telling them is the right thing and putting it this way.” And I’m like oh, no. So, anyway, maybe that was it. At the end of the whole thing, he lost six weeks. It was a couple hundred bucks, and he’s not even sure that this data at the very bitter end that he’s going to do a mail merge and do something with is what is the right stuff. And I’m like oh, no. And he goes, “Yup. I’m done.” But for some reason … Here’s my point. It doesn’t have to be that long. It doesn’t have to cost that much. You think you’re saving money by doing those things. Steven Butala: You’re not. That’s my whole point here. Jill DeWitt: But in the end you’re not. The six weeks and $500 you spent to get that to that point, you could have done in one weekend and a couple hundred books. Just pulling it yourself. Steven Butala: Or not trying. What’s the cost of not trying? Jill DeWitt: Well, here’s part of it, too. Let me back up. It’s simple, but it’s important. Every county is going to hand you their data in a different format. So, you’re going to try to do this again two counties over. Guess what? You start from scratch. And they might cost more, it might cost less. But now your VA, by the way, there’s another learning curve. Now all this data that’s just been dumped on your lap … If you’ve not looked at county data and looked at this gobbledygook batch of numbers and stuff that they send you. Sometimes you can’t even tell. Wait, is that the assessed mail? Is that the tax column? Wait, what is this? You don’t even know to understand what the columns are sometimes to work with the data is a nightmare. So, here’s why we’ve learned … And back in the day that was the only way that you had it. But now there’s thing like Real Quest Pro, where you know what, goodness, every county is downloaded the same way. Oh my gosh. I can do mailers with more than one county at the same time. Wow. Who knew? It all dumps into my spreadsheet the same way. So, not even on the front end, but going back and looking at the data later on, and going back and finding more information about a property. It’s so much easier to work with, and people I don’t think take that into consideration. But for me, it’s a huge time saver, and if I’m saving time, I’m saving money. Steven Butala: Yeah, well said. I’ll add to that. Anybody who’s tracking down the county to get data from them to do what we do is leaps and bounds ahead of people that don’t understand the data piece at all and the cost of data. Jill DeWitt: That’s true. Why not take it to the next level? Steven Butala: I haven’t talked to anybody recently who’s had a county, because I think we’re sending the message successfully that pulling county data to do what we do, it’ll work. It can work, and it does work. That’s the root of the data anyway that we use. It’s just you have to be an expert in reconstruction, data reconstruction. But anybody who understands that, they’re going to do fine. They’re going to do it a few times, and they’re going to say, oh, I have to find somebody like us. Jill DeWitt: At least this person knew what was going on, and they realized, okay, there’s got to be a better way. I can’t believe this took me this long. Steven Butala: The real cost and all of this is not buying into the fact that it works anyway. Steven Butala: Because then you’ll just say, you know, I’d rather spend $1,500 on something else. On bandit signs. And then you fail for sure. So, then you’re going to fail. Jill DeWitt: Here’s my example. Steven Butala: You are going to fail driving for dollars. You’re going to fail at all of these other ways. You might get lucky the first couple of times, but it won’t be consistent like mailings. Jill DeWitt: You know what it’s like for me? It’s like say I want to buy a new couch. I know I can look online. But I’m not going to do that. No, no, no, no. I want to drive store by store on Saturday and Sunday, and I’m going to do it … I’m not going to do it that way. Why use the Internet to help and look and see what’s on sale? No way. No, I’m going to go all over the town, all day Saturday, all day Sunday. I’m going to take my own pictures. I’m going to measure it myself. You know what I mean? Jill DeWitt: It’s kind of like that, but seriously that’s really how I feel like it is. It’s like are you really going to go store to store to store, and then come home and lay them all out on the kitchen table and line them all up and then pick the one. No, you’re not. You’re going to go on the Internet. You’re going to sort for what you want. You’re going to at least know going in that that store is having a sale. Let’s not be silly here or whatever. Or at least they have what you’re looking for, and it’s what you want to buy and it’s in the price range you’re willing to spend. I feel like it’s the same thing. Steven Butala: You know, if you’re a contractor or carpenter or an engineer, you use mathematical concepts to get … You measure twice, cut once, and if you’re an engineer specifically, it’s a [inaudible 00:16:52] concept you’ve learned and equations to do what you’re going to accomplish. You don’t just slap a bunch of stuff together and see if it works. There’s ways to do it that have been pre-determined to be successful. Right angles support … From an architecture standpoint, there’s angles that only work. A range of angles. With weight and there’s equations for everything. It’s the same way here. There are equations on how to do this with very predictable outcomes. So, the cost of not using data and not absorbing and realizing these concepts, they equal failure. Jill DeWitt: It’s just, for me, a lot of it’s time. Jill DeWitt: There’s so much time that’s wasted doing things the hard way and the long way. That’s it. And picking up the phone, calling people to check things, that’s old. Steven Butala: Yeah, the phone … We have a show coming up next week about how inefficient … If you are driving any traffic to a telephone number, in the end you have made yourself unscalable. We have a very, very successful member who — This is not my concept. He’s really reached out to us asking for help because all he does … He’s on the phone all day. Well, you’ve done it again. You’ve spent another, I don’t know, 18 minutes or so listening to the Land Investors show. Join us tomorrow for another episode where we talk about the Land Academy data that we use versus the House Academy data. I can’t wait. Jill can’t. Jill DeWitt: Oh my gosh. Another exciting episode. And we answer your questions. Should you have one, post it on our online community at LandInvestors.com. Go there. It’s free. I’m loving this data week thing. Jill DeWitt: I know you are. Steven Butala: I’m catching myself being a little monotone here, but jeez. I have all this stuff stored up in my soul. Jill DeWitt: I know that. Steven Butala: It needs to get shared. Jill DeWitt: This is Jack has to get it out week. Steven Butala: That’s what we should have called it. Jill DeWitt: Is that what that is? Jill DeWitt: Oh my gosh. Data week, aka Jack just really needs to vent. I get it. Steven Butala: Tomorrow’s Friday, so we need to have some fun a little bit. Talk about Land Academy and the success of it all. Jill DeWitt: I’m excited. That’s going to be good. Hey, share the fun by subscribing on iTunes or wherever you are listening, and while you’re at it please rate us there. Both: We are Steve and Jill.